“Eight police officers have been arrested in Brazil after a television channel broadcast images of two teenagers being shot dead in Sao Paulo. The murder happened on 16 March in a dark street of the Bras neighbourhood, in an area notorious for drug dealing. The security camera images show two armed men shooting the teenagers at close range - with a police car stationed nearby, before driving off. Prosecutors say it did not try to stop the violence or to pursue the killers. 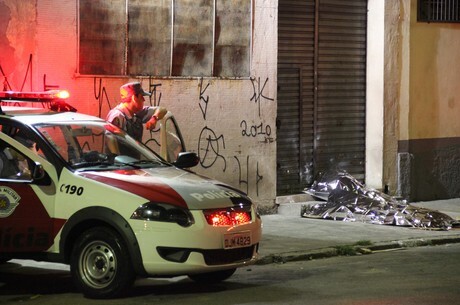 “The CCTV footage is shocking, as it shows that the policemen in that car were at least guilty of omission,” says Elizabeth Sato, director of Sao Paulo’s Homicide Department. There have long been allegations in Sao Paulo, Brazil’s largest city, that rogue police officers have been carrying out killing as acts of retaliation directed against criminal gangs, the BBC’s Gary Duffy says. But the attacks often claim the lives of ordinary civilians. Ms Sato says one of the victims was on his mobile phone when the two killers approached them. The person at the other end of the call heard the killers shouting that they were police, before telling the boys to put their hands up. The family of one of the victims, a 14-year-old known as Piui, denies he was involved with drugs. The teenager, who worked with his father collecting paper in the streets of Sao Paulo, had six gunshot wounds. The other victim, who was 18, was shot 12 times. Police has not disclosed their names. A third teenager managed to run away and police are trying to locate him.